Cirrhosis is the eighth leading cause of death in the United States, according to the National Institute of Diabetes and Digestive and Kidney Diseases (NIDDK). Because of chronic damage to the liver, scar tissue slowly replaces normal functioning liver tissue, progressively diminishing blood flow through the liver. As the normal liver tissue is lost, nutrients, hormones, drugs, and poisons are not processed effectively by the liver. In addition, protein production and other substances produced by the liver are inhibited. - Ascites - fluid build-up in the abdominal cavity. 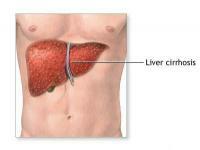 - Surgery -> liver transplant. Homeopathy helps to control further cellular damage. When introduced at an early stage of cirrhosis, homeopathic medicines can effectively reduce the viral count as well as give symptomatic relief without side effects.